On occasion I have in the past and will be in the future posting articles or stories on other websites for companies or individuals. FARASHATi is an up and coming fashion brand that focuses on conservative chic clothing for the modest fashionista. In addition to publishing a fashion themed blog they also have a more business themed blog. The aim is to try to give back to the “community” of fellow entrepreneurs by publishing informative blurbs a few times a month. The topics range from what great software to use to discussing how social networking can help your business. During the time the regular writer was on hiatus I was given the opportunity to write a few articles as a staff member. GLASSCITYCONNECT is a multi-purpose informational website centered around the people of Toledo, OH and surrounding areas. Specializing in social networking, promotion of young business owners, and community unity I felt privileged to be a writer for this site. I was promoted to Assistant Executive Editor for a brief moment and also a contributing writer on the site. My blog focused on new and useful software, programs, and websites for entrepreneurs and business owners. 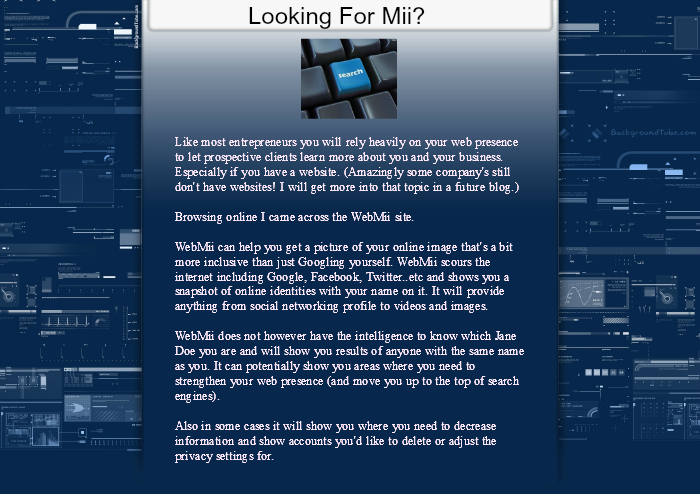 Looking for Mii? (January 16, 2010) – After going to search for the article I discovered the website is no longer live, luckily, as any writer should, I save all of my work 🙂 Click The Preview Below To Enlarge. In 2009 Gary Jensen was inspired to publish an informational eBook about engaging the interest of call center employees and boosting morale. Thanks to a LinkedIn post I was informed that he was looking for people to review it before it went to publication. As a former call center employee I jumped at the chance. It was so well written and with so many excellent tips that I actually forwarded it to my then call center manager after it was published.